You want to make this recipe. You do. Unless you are a vegetarian. And if you don’t eat red meat, you can use ground turkey. I suppose. 2 Tbsp brown rice – I recommend the Trader Joe’s brown rice. It microwaves in three minutes. Awesome. This is the recipe for one serving. But even if you are dining solo, you should make enough for 2 servings. You will want it for lunch tomorrow. If there are two in your party, make enough for four. I’m serious. And bossy. In a medium bowl, combine beef, brown rice, dried parsley, Italian seasoning, fennel seeds, garlic powder, red pepper flakes, dried minced onion, salt, and pepper. Mix well with clean hands or a fork. With a cookie scoop, or a spoon and your hands, form the beef mixture into 8 1-inch meatballs. 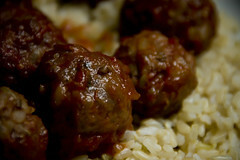 Place meatballs in a single layer on a small nonstick baking sheet. Bake about 7 minutes, or until meatballs are just barely pink inside. Transfer to medium bowl. In a small bowl, combine chili sauce and hot pepper sauce. Pour sauce over meatballs, and toss to coat. Serve immediately. This recipe is from a Biggest Loser Couples Weight Loss Planner from Prevention Magazine. It’s got 206 calories, 23 grams of protein, 17 rams of carbs, 5 grams of fat (2 of them saturated), 60 mg cholesterol, <1 g fiber, 678 mg sodium. That title made me laugh. I love the I suppose when you mention ground turkey. We’ll be trying this one!